The Back Bay izakaya, Uni, is not struggling in the shadow of its predecessor, Clio. Sure, that acclaimed French restaurant put chef Ken Oringer—and arguably, the Boston dining scene—on the culinary map. But the sashimi bar born in its lower level is more than pulling its weight: Look at Uni chef-partners Tony Messina and Oringer’s dual James Beard Award nominations this year for some proof. But one thing that hasn’t quite hit its stride yet is Uni’s bar program, says the new bar director, Vikram Hegde. As Clio, the restaurant had an innovative, expansive cocktail program from the unique mixology mind, Todd Maul. That legacy looms large, and while Uni has asserted itself with more Japanese spirits and sakes, the bar’s current identity is still muddled, Hegde says. He joined the team about a month ago, and his new cocktail menu debuts tonight. 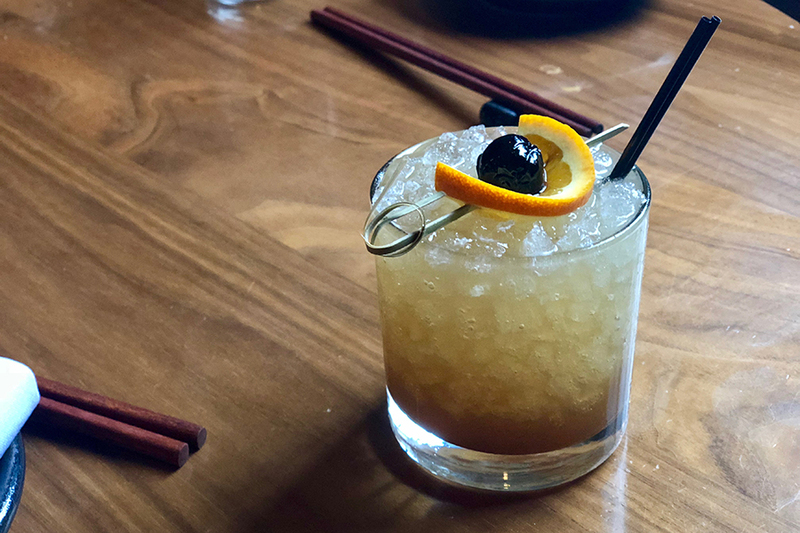 The highball menu developed by a predecessor is sticking around, alongside a brand-new tiki drink menu—check it out below. Hegde has been on the Boston bar scene for more than a decade, notably opening Island Creek Oyster Bar in 2010 with Jackson Cannon; and developing the drinks program at Sarma. He was opening bar director at Little Donkey, and he recently took over the bars at all of Oringer’s restaurants, including Coppa and Toro. Think “Uni versions” of tiki drinks—a classic Fog Cutter that subs Japanese whiskey for rum; or sweetness in another drink from Thai chili-infused honey. But with trendy tiki drinks, it is possible to overload the mug with too much going on, Hegde says. It always comes backs to balance. “The tiki style really does remind me of the [food menu at Uni],” he says. Messina puts so many flavors on each dish, but he blends them so well that the diner’s palate doesn’t get confused, Hegde explains. This style of drink-making accomplishes another goal of Uni’s new bar program: “You get a drink with an umbrella in it, it takes you out of that austere mindset that a restaurant at the price point of Uni can push you toward,” he says. Hegde brought in a device to make bia wun, or frozen, Thai-style “jelly beers”—Sapporo slushies, anyone?—and is also experimenting with liquid nitrogen, to pay homage to the avant garde cocktails of 1990s. These super-frozen sips are off menu specials for now, and Hegde plans for the bar program evolve. 370A Commonwealth Ave., Boston, 617-536-7200, uni-boston.com.